Maestro JoAnn Falletta leads the New Jersey Symphony Orchestra in Takht. Takht (pronounced in one syllable, takht), or ‘ensemble’ in Arabic, describes the typical Middle Eastern musical group that consists of most of the traditional instruments used in Arabic music, including the oud, qanun, kamanjah, ney, riqq, and darbakeh. Originally composed for a chamber orchestra of 15 players (one per part), this work reflects a symphonic expansion of the Western equivalent of that ensemble. Some of the instruments even share similarities between each other; for example, the 'ney' is similar to the flute in construction, while the 'kamanjah' sounds very much like the violin. An ongoing muse in my output thus far is the voice of arguably the most famous Egyptian singer who ever lived, Umm Kulthum (1898–1975), the “Star of the East.” In this particular work, her voice, in a sense, is brought back to life as the woodwinds, brass, and harp instrumentalists literally sing and play into their instruments, transforming the hall into an abstract depiction of Umm Kulthum’s permeating presence in the lives of millions of people that continue to adore her today. 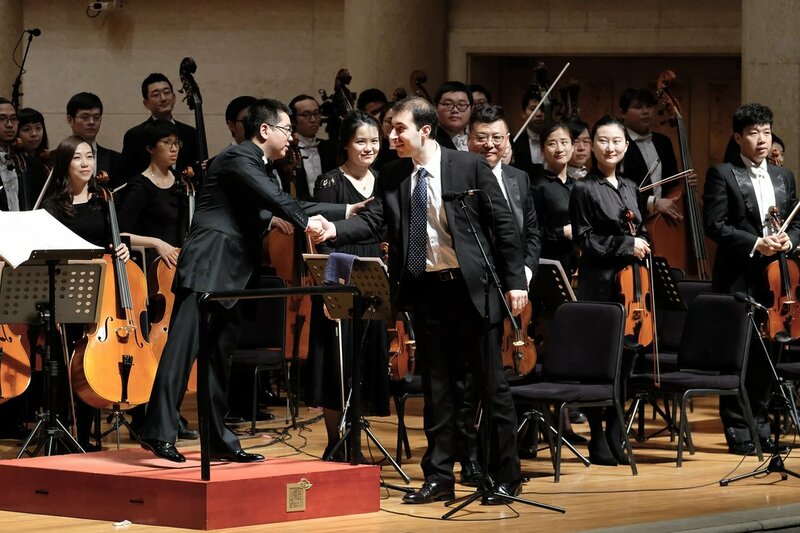 Maestro Yang Yang and the Hangzhou Philharmonic with Saad Haddad at the Asian premiere of Takht.